The so called GOP stalwarts, who have so brazenly yelled what a monster Donald Trump is, are falling one by one to the bullying charms of this authoritarian megalomaniac. Bold men like Mitch McConnell, Lindsey Graham, Ted Cruz, Marco Rubio are now sycophantic bootlickers of the orange haired menace. The latest to cave in meekly to the Donald: Republican Speaker of the House, Paul Ryan. Nothing’s changed really. For months, he claimed he wasn’t interested in taking over Speaker of the House for John Boehner and then suddenly …BOOM… he’s Speaker of the House. So I guess this latest development shouldn’t come as any surprise. Paul Ryan has been boldly stating (or conning) these past several months that he just can’t support Donald Trump. But after a ‘very important’ meeting this past week, Ryan now endorses Trump. What a man of integrity! Why shucky darn…with guys like Trump and Ryan leading the way, changing their points of view every time the wind blows, America’s sure to be great again in no time. 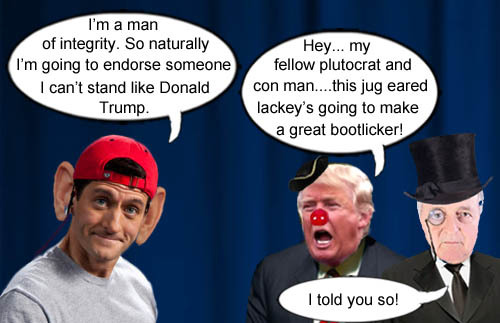 Speaker of the House, Paul Ryan, shows what a man of integrity he is by supporting someone he can’t stand like Donald Trump much to the delight of one of his plutocratic overlords. Copyright © 2003-19 BilgeBucket.com All Rights Reserved.